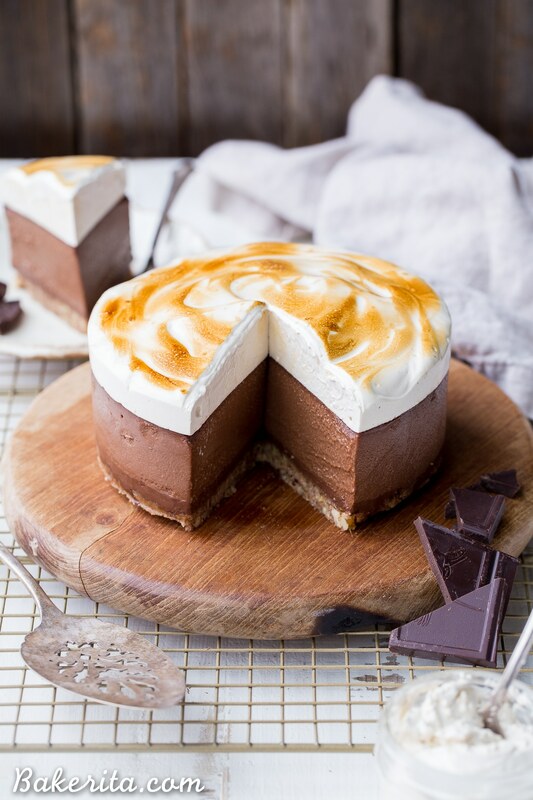 This No Bake S’mores Cheesecake has a graham cracker flavored crust topped with chocolate ganache, rich chocolate “cheesecake” made with soaked cashews, and a layer of homemade toasted marshmallow on top! You’d never guess this decadent dessert is gluten-free, dairy-free, and Paleo. This was one of those recipes I was a little nervous to make, not because I didn’t think it would taste delicious, but because I was sure that it would never turn out looking the way I was envisioning in my head. 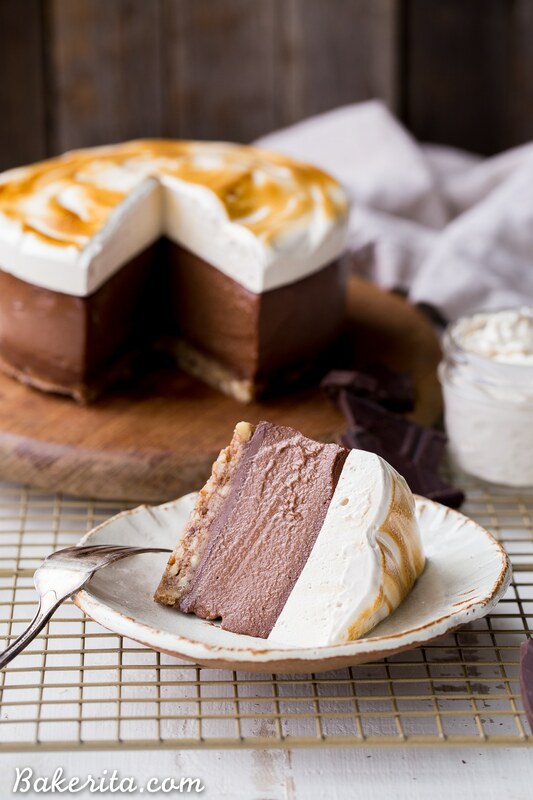 I imagined a dark, deeply chocolatey cheesecake layer, on top of a layer of chocolate ganache and a “graham cracker” flavored crust, with a pile of toasted marshmallow fluff on top. Each step of the way, I was doubting myself that it would turn out. And then, as each step was completed, looking just the way I wanted, I breathed out a little sigh of relief. As I made the marshmallow, the final step and the one I was most worried about, I kept doubting myself. Did I add enough gelatin? Will it set up, or am I going to take off the sides of the springform pan and have the whole thing spill down the sides and fall apart? As I wiggled off the pan and saw smooth sides and a perfect marshmallow layer, I realized I was worrying for no reason. I’ve been trying to argue against my worries lately, because usually, my worries never come to be. Instead of focusing on negative what-ifs, I’m trying to transition my thinking into channeling positive results. I’ve realized that usually, when I’m worrying, instead of mitigating the possibility, I’m stoking it’s fire, and giving it the energy it needs to come to be. By ignoring possible negative outcomes, I’m able to give credence to the positive outcomes that I’m after. 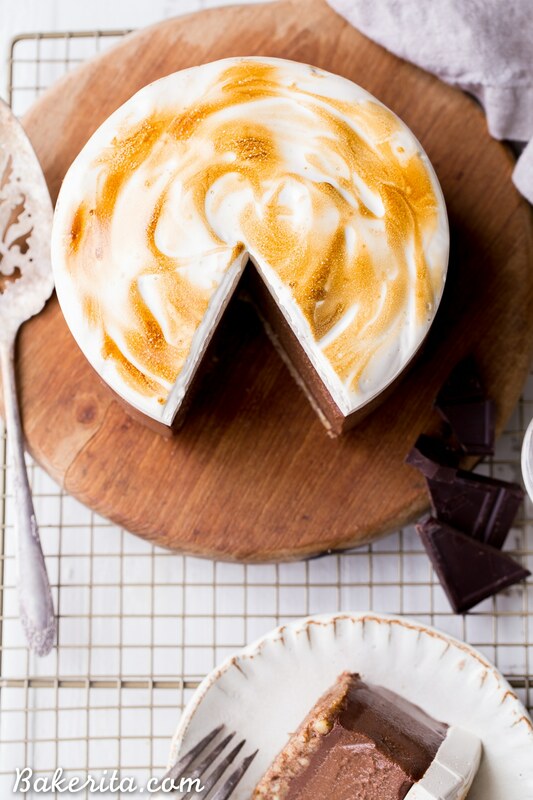 Now, thankfully, all my worries didn’t come to be in this S’mores Cheesecake. Instead, it turned out spectacularly, encompassing all the glorious flavors of s’mores I was after. 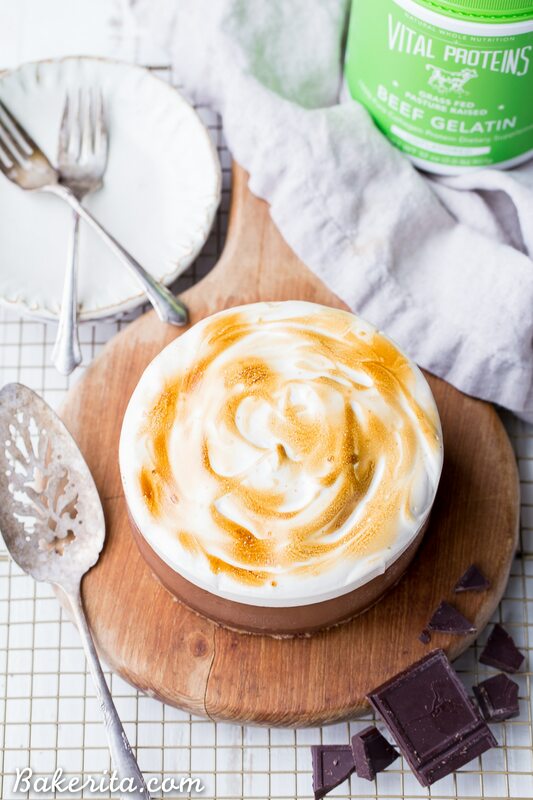 This S’mores Cheesecake is not your typical cheesecake; instead, it’s completely gluten-free, dairy-free, refined sugar-free, and Paleo-friendly. It starts with a crust that, although completely graham cracker free, gives the flavor profile we’re after. It’s barely sweetened with dates, and loaded with cinnamon for that graham cracker flavor. A layer of chocolate ganache is spread on top of the crust. The filling is cashew-based and turns out incredibly creamy after a long blend in a high-powered blender or food processor. It’s lightly sweetened with maple syrup and loaded up with melted dark chocolate, which gives that rich, deep chocolate flavor. And finally, that glorious marshmallow topping! This is the most difficult part of the process, for sure, but it’s still relatively simple to do – you just need to be paying attention to the temperature and make sure everything is well-greased so you don’t have a sticky mess! The marshmallows are made with Vital Proteins gelatin, which is my favorite because it’s grass-fed and amaaazing for your joints, skin, hair, nails, and gut health. 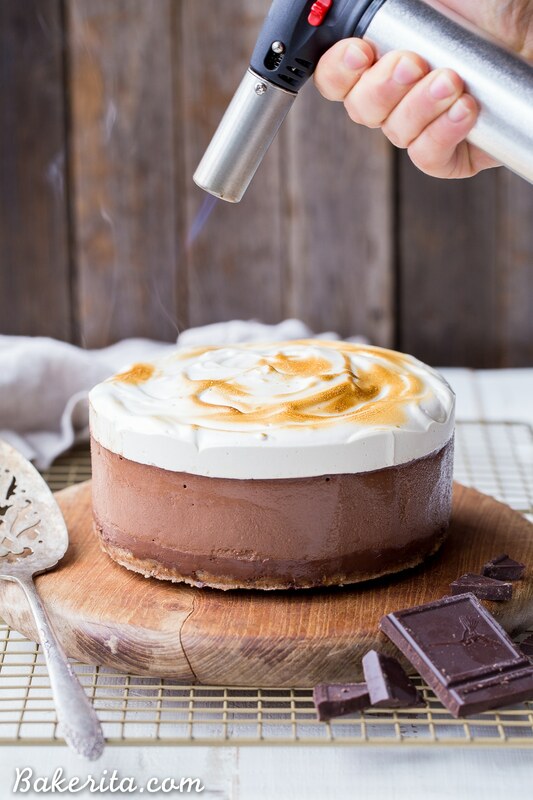 Once you’ve got your marshmallow piled on top of the chocolate cheesecake, let it set, remove the ring of the springform pan, and toast the top with a kitchen torch to get it nice and toasty. Because it can’t really be s’mores without a toasted marshmallow! This No Bake S'mores Cheesecake has a graham cracker flavored crust topped with chocolate ganache, rich chocolate "cheesecake" made with soaked cashews, and a layer of homemade toasted marshmallow on top! You'd never guess this decadent dessert is gluten-free, dairy-free, and Paleo. Chopped the dark chocolate very finely. Place in a heatproof bowl; set aside. In a microwavable bowl, heat the coconut milk for 1 minute or until steaming hot. Pour over the chocolate, making sure it’s all covered, and let sit for 2 minutes to let the chocolate melt. Whisk until smooth. Measure out 1/3 cup of the melted chocolate and spread it on the crust. Place in the fridge or freezer to harden. In the same food processor or high-powered blender used for the crust (no need to wash between - I used my Vitamix, but most powerful blenders should do the job), combine all of the filling ingredients, including the remaining melted chocolate, and blend for about 2 minutes, or until the mixture is silky smooth and creamy. Scrape down the sides as necessary. You may need to add a bit more coconut milk or lemon juice to get it to blend smoothly if your blender isn’t super high-powered. Pour the filling into the prepared pan over the chocolate. Smooth out the top and tap the pan hard against the counter a few times to release any air bubbles. Place in the freezer to set for at least 3 hours or until completely firm before topping with the marshmallow fluff. For the marshmallows, stir together the gelatin and 1/4 cup water in the bowl of a stand mixer fitted with the whisk attachment, making sure all the gelatin is moistened. In a small saucepan, combine the other 1/4 cup water, maple syrup, and salt. Bring to a boil and cook, stirring occasionally, until mixture reaches soft ball stage on a candy thermometer, about 238-240ºF (112-115ºC). Turn the stand mixer on low and stream the hot syrup over the gelatin. Once all the syrup has been added, slowly turn the speed up to medium-high and beat until the mixture becomes lukewarm and turns white, fluffy, and stretchy. Add the vanilla extract while it’s beating. This should take about 10 minutes. Once it’s ready, pile it on top of the cheesecake (you may not use it all) and toast until brown with a kitchen torch. You can spread any extra marshmallow into a small greased pan or ice cube tray to make some extra marshmallows. Slice and serve immediately, or store in the refrigerator. I recommend running your knife under hot water to warm it up before cutting the cheesecake with the still-hot (dried) knife. Prep time does not include chilling of the cheesecake between layers being added. Because gelatin is used, this recipe is not vegan. Agar agar may be substituted for the gelatin as a vegan alternative, but I haven't tried it so I can't make any guarantees. This post is sponsored by Vital Proteins. Thanks for supporting the brands that support Bakerita! SERIOUSLY Rachel, this is stunning!! I’ve been so excited for this recipe since you posted previews on your Insta Stories. And OF COURSE it turned out, no one’s surprised here :) Pinned! Is there any way to toast the marshmallow if you don’t have a blow torch? Thank you! Hi Luke, usually the broiler works but in this case, I think it would melt the cheesecake underneath…you could try using a lighter but I don’t think that would be strong enough. I think the torch is the best method in this case! I made this for Christmas Day. It was a huge hit!! Guests raving about it a few days later. I only substituted the marshmallow for my usual marshmallow recipe which is not sugar free.